Mix design is the process of selecting suitable ingredients of concrete & determining their relative quantities with the objective of producing as economically as possible concrete of certain minimum properties such as workability, strength & durability. Durocrete has special expertise in Concrete Mix Design having conducted more than 10, 000 mix design assignments ranging from M5 to M80 grade covering variety of special concretes like roller compacted concrete, high performance concrete and self compacting concrete. Durocrete also offers onsite support for implementation of mix design by way of site trials and trouble shooting. 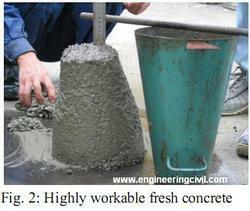 Our company has achieved laurels in providing Concrete Mix Design. Rajmi Geoexploration & Engineering Pvt. Ltd.
Durocrete Engineering Services Pvt Ltd.
Metro Lab is a leading name in the field of construction material testing with Laboratory located in Thane. Within a short period of time it has developed into a comprehensive Building Material Test House with testing facilities for a wide range of building materials covering Mechanical, Chemical and Non Destructive testing. We are conducting all type of concrete mix design with checking with respect to checking and verification of property of concrete ingredient as per Indian standards/relative specifications etc. It should be economical, durable and workable. We are providing Reinforced Concrete Design to our most reliable clients which are situated all round the nation. The offered designing services are specially executed as per the needs of the clients and are in compliance with the international parameters.